Though it doesn’t bloom until the heat of summer, usually long past Easter, the flowers of Passifloraceae are often said to refer to the symbolism of the Christian crucifixion, from which it gets one of its common names, passion vine. The beautiful and unusual pink, blue, red or purple blooms are said to represent Christ’s passion. The 10 petal-like parts represents the disciples of Jesus, excluding Peter and Judas; the 5 stamens the wounds Jesus received; the knob-like stigmas the nails; and the fringe or corona the crown of thorns; while the leaves are reminiscent of the Roman spear; and the tendrils are their whips. However like many plants, the passion vine has other common names. 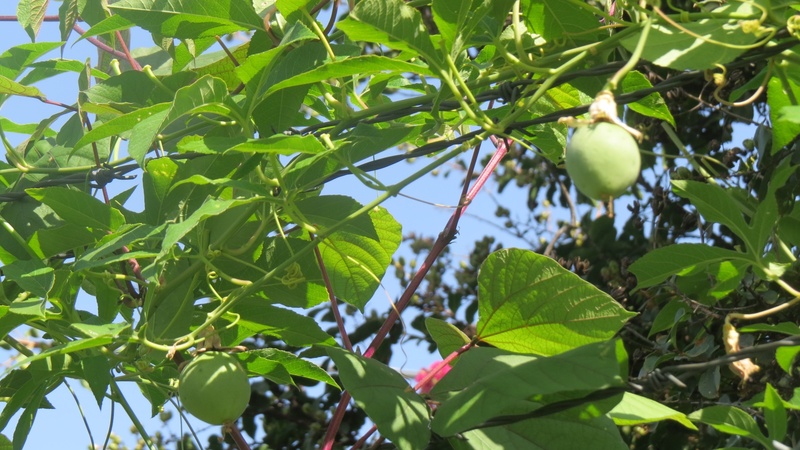 The name Maypop, which is used by many Southerners, comes from the loudly popping sound that the hollow, yellow fruits of P. incarnata make when crushed. Passiflora is a genus of about 500 species of flowering plants. They are mostly vines, with some being shrubs, and a few species being herbaceous. In North Texas several species of passion vines grow well here. 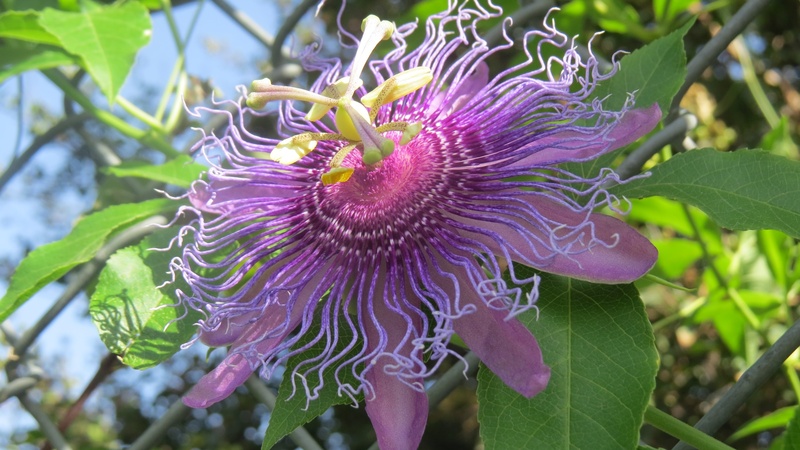 The two most common passion vines found in area nurseries are the Texas native Passiflora incarnata (Maypop) and the Hardy Blue Passionflower, P. caerulea. Maypop can withstand temperatures as low as 18 degrees F, while P. caerulea can tolerate temperatures to around 25 degrees. Other species of passion vines are becoming more available; however most of these are tropical plants and should be either treated as annuals or brought inside for the winter. Though the leaves of passion vines have been used in herbal medicine as a remedy for sleep disorders, nervousness, and many other ailments by indigenous peoples and the fruit was a staple of their diet, today most gardeners grow the plant for its quick growing, vining qualities, beautiful flowers and as a butterfly host plant. In general, passion vines require full sun (though they can tolerate some partial shade), regular watering, and excellent drainage. According to Scott Perry’s article, Planting Passion, in Texas Gardener magazine, a 10-5-20 fertilizer should be applied several times a year at four-to six-week intervals throughout the growing season. However, overfeeding can cause root damage; and fertilizers too high in nitrogen can cause excessive foliage development and reduced flower development. Passion vines, which can grow up to thirty feet in a season and should be grown on a strong support, are remarkably pest free. However there is one “pest” that can defoliate a passion vine quite quickly. However, this same “pest” is the reason why many butterfly enthusiasts grow passion vines in their gardens. The passion vine is the sole host plant for several Texas butterflies of the family Heliconius. This family includes the Zebra, the Julia, and the Gulf Fritillary (a very common butterfly found in Dallas.) The rather fearsome looking (but harmless to people) caterpillars, when feeding on the passion vine, derive some toxic compounds from the leaves. This, in turn, makes the larvae and butterflies somewhat toxic to predators. 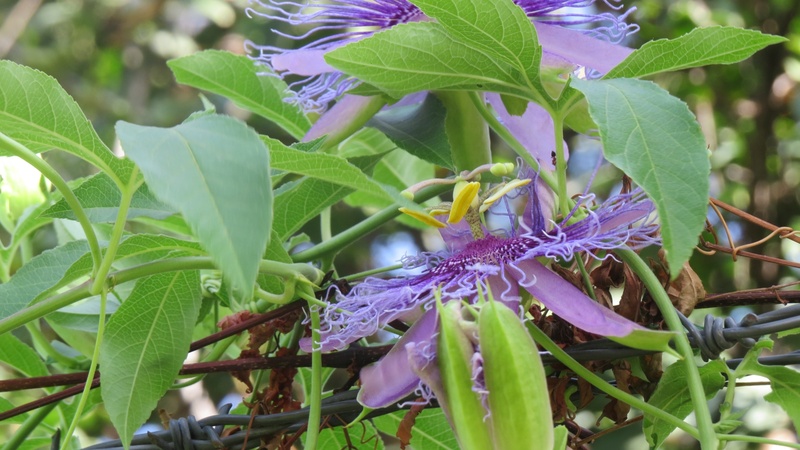 Many butterfly gardeners either grow a large enough stand of passion vines so that some defoliation will not matter or relocate the caterpillars to a designated butterfly garden where the passion vine is grown specifically to be a host plant. If you are interested in planting a passion vine in your yard and “growing your own butterflies,” a very good place to purchase many varieties of passion vine is at the Texas Discovery Gardens (www.texasdiscoverygardens.org/plant_sale.php) plant sale. This year’s sale will take place on April 18-19th, 2015, with the Members Preview Sale on the 17th. It’s a great place to buy organically grown butterfly host and nectar plants as well as many unusual varieties of plants not found at most area nurseries. Note: The Passion Vine at our Demonstration Garden flourished without fertilizer of any kind. Posted in Vines for Texas and tagged Butterfly Host Plant, Passion Vine, Texas Discovery Garden. Bookmark the permalink. I bought some passionflower vine at Texas Discovery Gardens plant sale. I bought the purple kind and the white flowering kind. The purple has survived several winters, dying but returning in late spring. The gulf fritillary caterpillars are so much fun to see. I have witnessed (and just today caught on film) a gulf fritillary butterfly ovipositing on my vine. I’ve watched a gulf frit go into chrysalis stage. (I caught this on my phone’s camera too)! Nature is awesome! Thank you, Nadine, for sharing your experience with us and we agree nature is awesome. Have you heard about our Monarch tagging demonstration? At 12:30 pm (and October 5th at noon) Ellen Guiling, Master Naturalist, will be tagging Monarchs at Raincatcher’s garden for data collection done by the Monarch Watch program. Bring water, a hat, and a butterfly net (if you have one). During this time of year, new generations of Monarch butterflies embark on an incredible journey south. Come learn about their migratory path across Texas, obstacles they face, and their destination in Mexico. We’ll take a walk to look for monarchs fueling up for the rest of their trip and tag them for study of their migration patterns.